Here you can find a strain description about Trainwreck and also some user-based reviews and infos directly from the SeedFinder (if available). 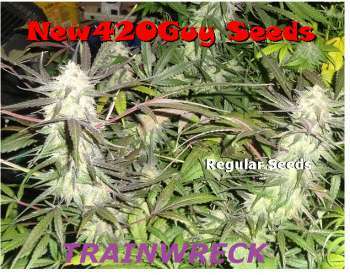 You can also find the offers and auctions here if Trainwreck cannabis seeds are on stock at MyCannapot right now. Ramones123 I bought 3 of these guys from 420seedguys and 1 turned into male, and others turned into female. 1 didn't make it, the others did. The male found is a very good product that has sooooo much pollen and,grows super fast. The female is nice as well and not overly growing like the,male. 46nkid I did not get to harvest this beauty, due to the fact that "she" turned out to be a he. However, I was very, very impressed with not only the strength of this plant (it withstood a soil ph of 8.7 for weeks with barely any visible problems, and it took the brunt of your normal, everyday, high temperatures. Like 105F (40C) as a seedling.) but the trichome production as well. As I turned it into mulch to be added into my compost pile, it made my hands rather sticky, pretty impressive (I think) for a two week old male. If it would have had a more pronounced aroma, which only became evident at all to me when I was ripping it apart (and believe me, I checked and checked for a smell), he would have been put into his own area until he shed that pollen. Ahh well. This was a very good introduction to New420Guy Seeds, getting a male that was this desirable, but I am hoping for a female in my next run of Trainwreck to see what she can really do. Buy Trainwreck now at MyCannapot!